Home » New York City » Why is the Rent in NYC so High? Why is the Rent in NYC so High? If you are like me, your idea of what it costs to rent in NYC is far from the reality. Nearly every apartment you will find online or see through a real estate agent is part of New York’s non-regulated rental stock, which makes up only about one-third of the apartments out there. You may be surprised to learn that the other two-thirds, those that you are not seeing, pay an average rent of about $1,000 per month. To start, it is a myth that all of New York City is unaffordable. As demonstrated in this analysis by Constantine Valhouli, outside of Manhattan and western Brooklyn, housing is generally pretty affordable. 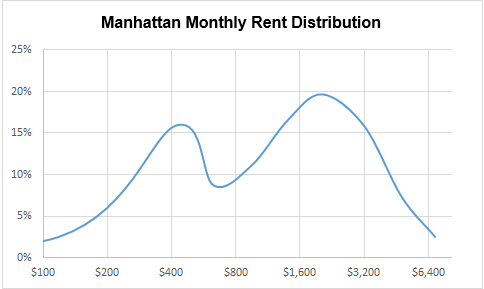 So, the real question becomes, why are rents in Manhattan so expensive? But first, let’s start with a simpler question. What is the average rent in Manhattan? Why do these two sources disagree by so much? Because they are based on very different samples. 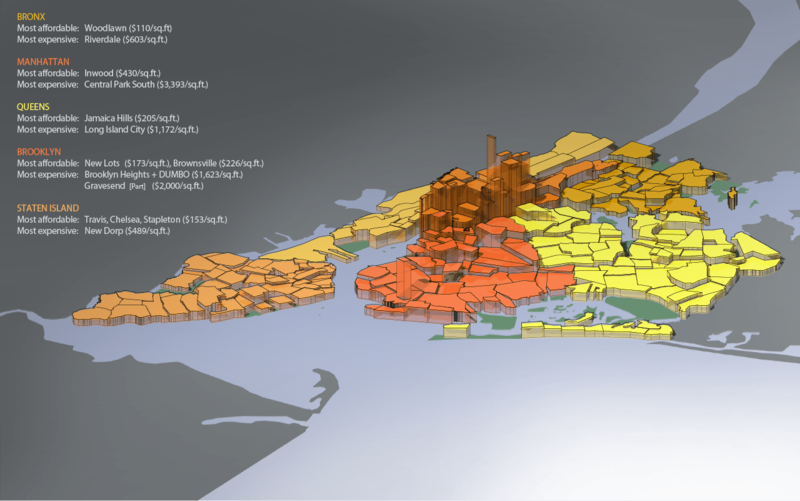 The Census’s figure is for all intents and purposes the “correct” number, based a cross section of households in Manhattan. In contrast, the Douglas Elliman report is based on the rental listings that the brokerage sees. These are essentially the same listings that you see when you search any real estate portal on the web. However, excluded from Elliman’s sample are public and rent-regulated housing, which make up the majority of Manhattan’s apartments. Here is how Manhattan’s rental apartment stock breaks down. 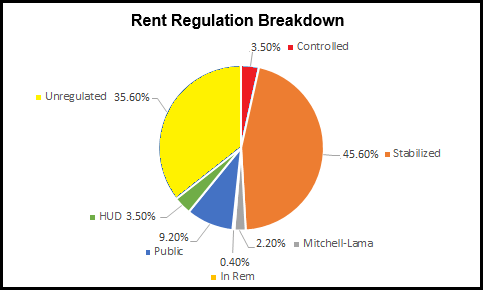 As shown in the chart above, only 36% of rental apartments in Manhattan are unregulated. For apartment seekers that do not qualify for the highly-coveted rent-regulated units, 64% of the available rental supply is effectively out of the picture. Rent regulation fences off 64% of Manhattan’s available housing stock. Here is how the distribution of rents looks. In most cities, this distribution looks much more like a typical bell curve, with a single peak in the center. In Manhattan, because of the city’s rent regulation policy, you get this unnatural-looking two-humped shape. And the story it tells is simple. On the left side, there are a lot of apartments that most of us do not quality for. On the right side, there are a lot of apartments that most of us cannot afford. What’s left over is a relatively small slice in the center, which is what the majority of apartment seekers are fighting over. I am certainly not against rent regulation. Without it, NYC would become segregated along socioeconomic lines. And there have been enough examples, such as Chicago in the 1980’s, showing why that is not a good idea. However, I think an important part of the rent regulation debate has been left out – what is left over for the middle class. 4/1/2015 Update: Based on several responses I have received, I would like to clarify that the problem of access to rent regulated apartments is more complex than just income limits. Availabilities are infrequent because people who have them are disincentivized from leaving. And when they do become available, access often goes to “insiders” with the right relationships. Previous Article Illegal Conversions – What’s the Real Story? I have lived in a 2 bedroom rent controlled apartment in the Bronx since 1969. My current rent is $1560 a month. How is that rent controlled? Knowing nothing else about your apartment, that sounds very high. There are many market-rate 2br’s in the Bronx available for less. Though if Bronx rents start going up the way some people are predicting, you may be very thankful later. This is interesting. I wonder about apartments that are rent stabilized but which are offered for a market-value “preferred rent” — less than their rent-stabilization price cap. It would seem that these, along with the “unregulated,” should be considered among those counted as part of the “slice in the center, which is what the majority of apartment seekers are fighting over.” I’m just not aware of what proportion of the stabilized apartments are asking/accepting such preferred rent amounts and whether this data is even available. Good point. A rent stabilized apartment whose stabilization cap is above the market rent is really for all intents and purposes a “market rate” apartment. On the other side, there is also a surprisingly high number of cases where people pay “below market” rents in unregulated apartments. You see this when a house / apartment has been illegally converted or has an illegal basement apartment and in some other unusual cases. That’s all well and good, but unless you put your name on a waiting list 20 years ago, and your income falls within a certain range, none of these “affordable” apartments are available to you. There are people poorer than you who have been waiting 20 years ahead of you on line. What is your proposal to make this type of Real Estate available to the general public? Just as you said you have to have a “hookup” to get them. Personally, I think the system itself is the problem. Affordable housing should go to those who need it, not people with the right connections or those who happen to get there first. In that regard, I think something like London’s system of council housing and housing associations would be a better solution. Though that system has its own problems too. It’s so frustrating because the NYC HDC has so many apartments listed at their site, where you can apply to be entered in the lottery (https://a806-housingconnect.nyc.gov/nyclottery/lottery.html#current-projects) but most of them have such low income gaps, that frankly, I don’t know how anyone could live off of that and be in Manhattan too. There’s absolutely nothing for the middle class, who makes just enough to be cut off from assistance, but not enough to get into anyplace with less than a soul-crushing hour+ commute to the city. Yes, the middle class ends up getting squeezed! You may want to have a look at the HDC website, which does have some middle income housing you can apply for. Mitchel-Lama also has higher income limits, though most of them will not be listed online. The price of not having “segregation along socioeconomic lines” is that some people who would otherwise be able to live in Manhattan – what you call the “middle class” – are not able to live in Manhattan because of the cost. As always, price controls cause a shortage. Massachusetts banned rent control two decades ago, and the results have been uniformly positive in formerly rent controlled communities. Boston has affordable housing too. It is just considered “government subsidized” rather than “rent controlled.” Boston also does not have nearly the wealth disparity as NYC. New York is just not that cool any more. The high rents and fees make it unaffordable for those people who make the city cool, i.e. the starving artists, musicians and performers. Now, you end up with the millionaire rock band U2 in the NYC subway pretending to be cool by being street performers. I find this analysis galling. You state “I am certainly not against rent regulation. Without it, NYC would become segregated along socioeconomic lines.” Are the other 99% of cities without rent control “segregated”? Of course not! In fact, they have much better housing affordability metrics than NYC and lower inequality. Rent control has distorted the housing in NYC, and for the vast majority of people, that’s a bad thing. Sounds like we agree. Rent stabilization / rent control has made the City unaffordable for everyone else, which is indeed a bad thing. But complete deregulation is not the answer either. I don’t understand your comparison to other cities. All big cities in the U.S. have some form of affordable housing policy. Many are even more segregated than NYC. And very few, if any, cities in the U.S. have nearly the size, density, wealth, and diversity to even be comparable.